The spookiest time of the year is also the time when people are hosting parties, buying costumes and decorations, making dinner reservations and open to hearing about great deals on goods and services that can help them celebrate the holiday. Use SMS marketing for Halloween fun to take advantage of the excitement of the spooky celebrations. With just a little creativity you could come up with a festive mass texting strategy that excites and delights everyone on your list. Here’s how one company leverage SMS marketing to capitalize on Halloween. 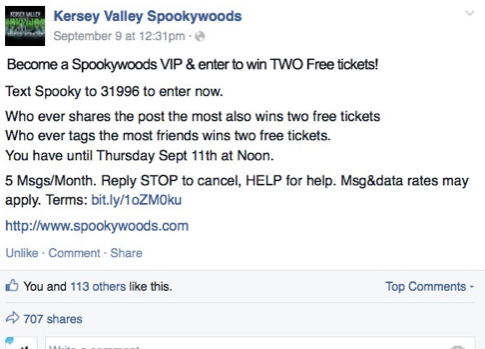 For this example we’re going to dive deep into the strategy Kersey Valley Spookywoods used to up their Halloween marketing tactics. Kersey Valley is a multi attraction resort that offers laser tag, corn mazes, haunted attractions and zip-line courses across their 60 acre property. SlickText worked closely with Tony Wohlgemuth, founder of Kersey Valley Inc., to help him develop an SMS marketing growth strategy. This is the detailed case study of what Wohlgemuth and his team did to engage and grow their subscriber list. Not sure how to get subscribers? Start with the basics. 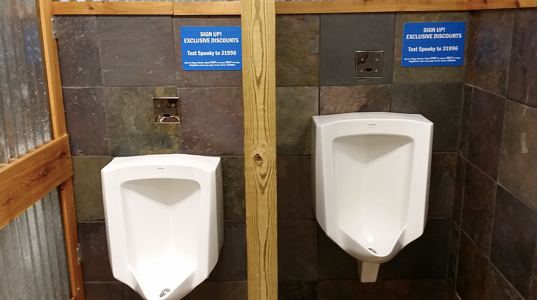 For Kersey Valley we installed restroom signage to capture subscribers during events and developed a web widget for site visitors. Our initial launch using these methods received with 152 opt-in subscribers in two days. We also announced the campaign on Facebook, encouraging fans to opt in for exclusive offers. At this point there were no incentives to join the list or contests running. The only motivation was promise of future exclusive offers. Growth spiked by 447 subscribers in one day alone. This post reached 15,000 people, and had 62 shares in just a few hours. Within 24 hours, there were 436 new subscribers on Wohlgemuth’s list. Next, Spookywoods offered their customers an exclusive pricing incentive for the grand opening. 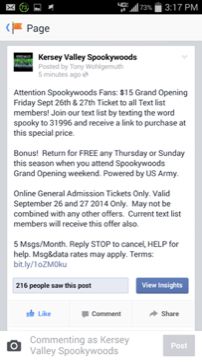 Customers were invited to text SPOOKY to 31996 to receive this offer and become a Spookywoods VIP members. After the list had grown, Spookywoods then sent out the exclusive pricing information to the new members. How did customers respond to this exclusive offer? When the campaign was released, Spookywoods had 3,304 active subscribers. They sold 94 tickets before the offer was pulled. You will notice a trend as you continue reading. 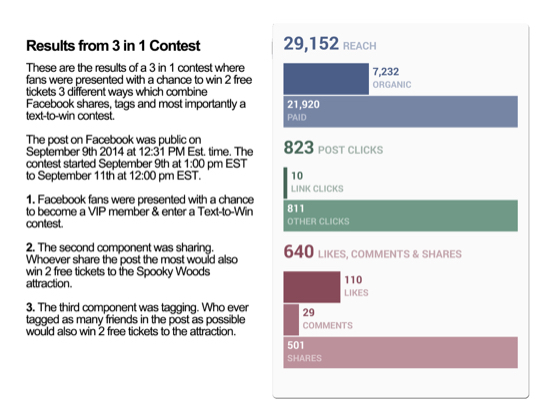 Spookywoods tweaks the release time and type of offer over the next few promotions and response increases drastically. This response increase can also be credited to the proximity of Halloween. Spookywoods kept experimenting with different offers and their timing. They followed up their earlier offer by sending a new exclusive offer to their growing list 4,419 subscribers. The campaign followed SlickText’s proven guideline for response and used a scarcity tactic to encourage instant action. The following campaign was limited to the first 200 buyers and provided a link to Eventbrite to purchase tickets. How did their customers react? Upon the campaign’s release, ticket sales instantly spiked. In the first 10 minutes, Spookywoods sold 150 tickets, and within the following 15 minutes, reached the limit of 200 at the exclusive rate. Customer response: Upon the campaign’s release on 10/26/14 at 5:27 PM EST, the offer sold out within 8 Minutes. Customer response: Upon the campaign’s release on 10/30/14 at 5:14 PM EST, the offer sold out within 3 Minutes. Customer response: Upon the campaign’s release on 10/31/14 at 4:01 PM EST, the offer SOLD OUT within 10 minutes. 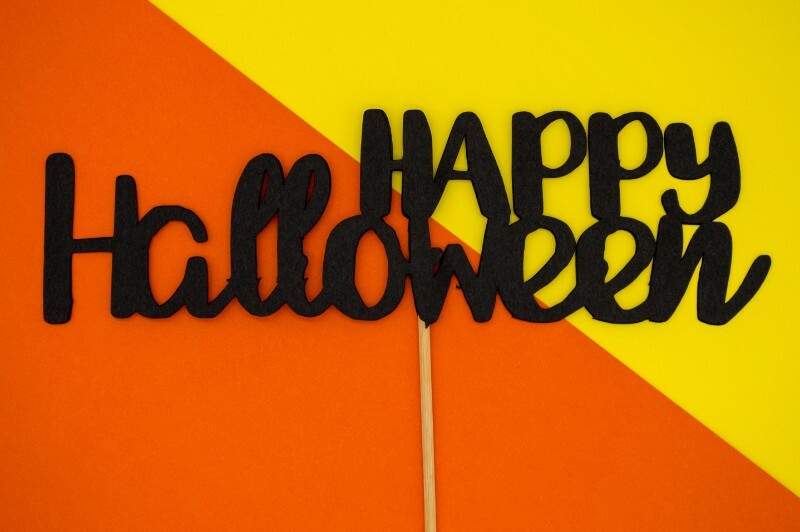 Can you use the same SMS marketing for Halloween each year? While you always want to find ways to keep your SMS and MMS marketing fresh and exciting for your customers, you don’t have to completely revamp your texting strategy every year. In fact, we caught up with Spookywoods two years after they initially began running their text message marketing campaigns used in the examples here. After two years of using SMS marketing to grow their list, Spookywoods had perfected their strategy. Wohlgemuth’s latest campaign boasted a 3142% return on investment. Here’s how his customers responded: The campaign was sent on 8/28/16 at 1:35 P.M. to 8,762 targeted subscribers. Spookywoods hit $10,000 in sales by the 3rd day. On the final day, 40 minutes before the offer ended, they had reached over $11,000 in sales. When you take the initial $350 investment, and divide it into $11,000, you get a jaw-dropping 3142% ROI. Why such a good response? In previous campaigns, Tony limited the number of tickets available for purchase. This encouraged an instant response, and his offers sold out in minutes. But, this also limited the amount of sales he could obtain. In this SMS campaign, the goal was to provide an exclusive offer that was limited by time, not quantity. Tony left his offer open for five days. Only VIP text list members knew about it. He created a unique link for early access, which helped him accurately track ROI. This link brought subscribers right to the shopping cart, which put them in the optimal position to buy.